Until his fateful involvement in the plot to fix a World Series, Fred McMullin was known as the Chicago White Sox’ “lucky man.”1 His addition to the starting lineup coincided with late-season surges to win the American League pennant in 1917 and 1919. Fred McMullin’s story is a series of contrasts. A man once commended for chasing gamblers off a field in Boston was suspended permanently because he accepted a $5,000 bribe to help his team lose. He was indicted by a Chicago grand jury in a story that made headlines across the nation, yet he spent the final decade of his life as a respected lawman in California. The move paid off for both. The Giants surged to win 27 of their final 31 games and take the pennant, while McMullin finished the year strongly and began to feel at home with Tacoma. Mac, as he was often called, ended his first full professional season with a .250 average, including 21 doubles and 6 home runs, in 141 games. Expectations were higher for McMullin after he had a year of experience. Manager Joe McGinnity placed his young second baseman in the cleanup spot to open the season, giving McMullin a great boost of confidence. Mac made enough of an impression that McGinnity released captain Bill Yohe on June 15 and installed McMullin at third base.10 Mac began to set himself apart in the field, and he was frequently cited in newspaper reports for his heady play. The Detroit Tigers asked for Mac to report “at once.”12 McMullin’s contract was sold for $2,000 on August 13, and he left to join the Tigers in Cleveland. But with Donie Bush firmly in place at shortstop, and George Moriarty and Ossie Vitt holding down the fort at third base, the Tigers didn’t have much room in the infield for a rookie. 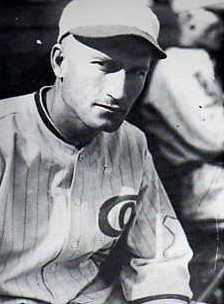 Mac rode the bench for nearly two weeks without once appearing in the lineup for Hall of Fame manager Hughie Jennings. Watching greats like Ty Cobb and Sam Crawford must have been exciting for McMullin, who had never attended a major-league game. But he longed to get on the field. He did – just once. His major-league debut came on August 27, 1914, and it was the only appearance Mac made with the Tigers. Delia was the daughter of an Austrian immigrant who had moved west with her family around the same time as the McMullins a decade earlier; they had also settled in Lincoln Heights near downtown Los Angeles. Born in 1892 in Fort Lee, New Jersey, Delia was the oldest of Louis and Margaret (Kotze) Barnabe’s three children. Their youngest son, Charles Barnabe, played 16 seasons in professional baseball, including 29 appearances for the White Sox in 1927-28. In the meantime, the Chicago White Sox and New York Yankees were engaged in a fierce battle for McMullin’s services. However, according to Los Angeles Times writer Harry A. Williams, an urgent telegram from Comiskey arrived in Darmody’s office 10 minutes before Davis showed up – closing the deal with Chicago. Reported Williams: “Davis was visibly disappointed. … The sale of Terry and Mac to the White Sox was outright and for cash, delivery to be made next spring. … Fast and brainy, Terry and McMullen [sic] not only form the youngest keystone combination in the league, but one of the best in its history. … It was only by a small fraction of time that Terry and McMullen failed to land with New York instead of Chicago.” The two players were sold for $7,000 each and finished out the season with the Angels.22 McMullin hit at a solid .279 clip, with 25 doubles and 33 stolen bases (eighth in the league). He was also the PCL’s top sacrifice bunter, with 49. Chicago’s infield, like the Tigers’ a year earlier, was crowded. Mac had an idea how tough it would be to break into the Sox lineup: “The only chance I would have against [Eddie] Collins at second base would be for Eddie to drop dead.”23 Zeb Terry, not McMullin, won the shortstop’s job in spring training, while Buck Weaver began the season at third base. Mac would have to wait to get a chance in the big leagues. Even his first appearance with the White Sox was not an appearance at all – on April 16 against the Browns, McMullin was sent up to pinch-hit for pitcher Mellie Wolfgang in the seventh inning. St. Louis then substituted Dave Davenport for starter Carl Weilman, who had walked the bases loaded. So Chicago manager Pants Rowland replaced McMullin with lefty-hitting Jack Lapp to face the right-handed Davenport. Lapp walked to force in a run, but the White Sox still lost the game, 6-5. The moves paid immediate dividends, as the White Sox’ three-game losing streak ended with a 5-3 win. Rowland stuck with the revamped lineup the next day, and Mac singled to drive in his first major-league run, the Sox’ only run in a 2-1 loss to Cleveland, on April 28. Chicago ran off three straight wins after the shakeup, but then lost nine of 11 to fall into last place. McMullin returned to the starting lineup on July 10, going hitless in seven at-bats in a doubleheader against the Red Sox. The time off had disrupted his hitting stroke. He began a 2-for-25 slump, and his average fell to .257 by the end of the season. Chicago moved into a tie for first in early August, but the White Sox’ run atop the American League lasted less than a week and Boston won its second consecutive pennant. Later that month, on November 23, Fred’s wife, Delia, delivered a son, William, at home in Los Angeles. Mac was overjoyed – even going so far as to publicly request a trade back to the Coast League so he could be closer to his family.27 McMullin’s “holdout” didn’t last long; he signed another one-year deal with Chicago on February 27 and prepared for training camp at Mineral Wells, Texas.28 Thirty-year-old veteran Chick Gandil had been purchased from Cleveland for $3,500 to shore up first base. With Eddie Collins and Buck Weaver still around, shortstop was the only open position – and four players were fighting for it. Risberg won the shortstop job to open the season and the White Sox started on fire, winning five of their first six games and nine of their first eleven. Pitcher Eddie Cicotte, on his way to a league-leading 28 wins and 1.53 ERA, no-hit the St. Louis Browns in his first start, on April 14. By the end of the month, the White Sox were tied for first place and their lineup was set – and healthy. As a result, McMullin and four other reserves remained in Chicago as the team left for a road trip to Cleveland and St. Louis. Mac had made only two pinch-hit appearances, grounding out both times. On June 16 McMullin’s name appeared in the same sentence with gamblers for the first time. This time, he was hailed as a hero (at least in Chicago). Eventually, the dust settled and play resumed in the fifth. Weaver became one of the first few players to hit a home run over the left-field wall at Fenway Park (not yet painted green, or known as “The Monster”), and the White Sox beat the Red Sox, 7-2. Ban Johnson raised a ruckus after hearing of the riot in Boston. The founder of the American League “declared war on gamblers,” who he admitted had instigated the riot. “Gambling has never been tolerated by our league,” Johnson said. “This spring, [Red Sox owner Harry] Frazee advised me he had installed special police in the pavilion where the gamblers congregate. They were put there solely to break up the practice.”34 The gamblers, of course, continued to congregate – at Fenway Park, and across the major leagues. In early September the White Sox went on a tear. A four-game sweep of the Tigers on Labor Day weekend – an infamous series that would be recalled 10 years later, as Swede Risberg and Chick Gandil accused Detroit of laying down – was the start of a nine-game winning streak for Chicago. With Weaver out because of a broken hand, Mac was in the thick of it all. On September 5 he led a game-winning rally in the 11th inning to beat St. Louis, 4-1. Four days later he initiated a clash with Cleveland’s Jack Graney that resulted in a riot, and the game was forfeited to the White Sox. Chicago opened up a six-game lead on Boston to coast to the pennant. McMullin had a similar influence in Game One against the Giants. He was hailed as “Chicago’s hero” after driving in the first run of the fall classic. His third-inning double eluded New York center fielder Benny Kauff and scored Shano Collins to give the White Sox a 1-0 lead. One inning later, Happy Felsch homered to provide the decisive margin in a 2-1 victory behind Eddie Cicotte. Mac finished 1-for-3 and made two spectacular plays in the field. In Game Two, McMullin’s RBI single to center knocked out losing pitcher Fred Anderson in the fourth inning as the White Sox scored five times and breezed to a 7-2 win. He again handled three chances in the field flawlessly. Mac took advantage of the opportunity and, by May 8, he was hitting an even .400 – second only to Boston’s Babe Ruth (.407) in the American League, and ahead of Tris Speaker (.393) and teammate Joe Jackson (.379). But a 4-for-27 slump over the next seven games dropped McMullin’s average and, a week later, he was down to .299. His productive season came to a halt on May 30, when he was spiked by Cleveland’s Ray Chapman in the first inning of the nightcap and carried off the field with a deep gash just above his knee. He missed nearly three weeks and was only rushed back then because Weaver was out with a strained groin and Risberg was bruised up, as well. At the time of his injury, McMullin was hitting .312. By then the defending champion White Sox were floundering just barely above .500, in fourth place. They were without the services of Joe Jackson, who had taken a job in the shipyards. In late June Chick Gandil left a game in the seventh inning to make an appearance before his draft board on his plea for deferment.42 World War I cast a great shadow over baseball in 1918, and every team was affected. But the White Sox, on the backs of pitchers Eddie Cicotte and Lefty Williams, soared to a 24-7 start to take a five-game lead on Cleveland. McMullin received scant playing time in the first three months. His longest stretch was in replacement of an injured Eddie Collins at second base for a few games in late May. But as the Sox slumped in June, falling out of the league lead for the first time on June 23, new manager Kid Gleason – a longtime White Sox coach who had taken over for Pants Rowland – decided to shake up his lineup. It did. Just as in 1917, the White Sox immediately got hot. After leaving St. Louis, Chicago took three of four from Cleveland and came home to win four of five against Detroit to storm back atop the standings. McMullin’s best effort was a 4-for-5, two-triple performance on July 13, his single-game high for hits. He finished the season with career-best totals in batting (.294), doubles (8), and RBIs (19) in 60 appearances. What compelled McMullin to risk his career for a promised payoff of $20,000? Perhaps he was frustrated over his lack of playing time – he had certainly played well enough to warrant a starting job in the major leagues, and the White Sox had never seemed to give him a fair chance at that. Or maybe he was bitter at Comiskey’s dismissal of his desire to be closer to Los Angeles, near his family. His preseason holdouts usually had been accompanied by demands for a trade. And while Comiskey’s reputation as a penny-pinching magnate has lived on despite the fact that his payroll was near the top of the American League,56 McMullin’s salary of $2,750 was among the lowest on the team. A nearly 1,000 percent raise for a week’s worth of work would go a long way. Whatever his motivation actually was, McMullin didn’t receive many opportunities – at least on the field – to “earn” the $5,000 he reportedly received for agreeing to help throw the World Series. He singled in a pinch-hit appearance off Reds starter Dutch Ruether in the eighth inning of Game One, and grounded out against Cincinnati’s Slim Sallee to end Game Two. Both were White Sox losses. Chicago went on to lose the best-of-nine Series in eight games. By September the talk of corruption in baseball was too loud to ignore. A grand jury was convened in Chicago, and McMullin was implicated along with Buck Weaver, Chick Gandil, Swede Risberg, Joe Jackson, Eddie Cicotte, Lefty Williams, and Happy Felsch for fixing the 1919 World Series. So McMullin watched from afar as a jury failed to convict his seven former teammates, returning their verdict at 11:22 P.M. But whatever hope he had of returning to the White Sox was short-lived, as Judge Landis famously banned them all the next day. McMullin’s professional career was over. Both son William and daughter Ionia exhibited their father’s skill on the diamond, playing ball for their high-school teams in the mid-1930s. Fred attended their games regularly, and was also seen at various semipro games in Lincoln Heights and at Brookside Park in nearby Pasadena.80 Ionia later earned a degree from UCLA, as did her younger sister, Delia. A version of this biography appears in "Scandal on the South Side: The 1919 Chicago White Sox" (SABR, 2015). Click here for more information or to order the book. Special thanks to the following for their generous assistance: Mark Armour, Carlos Bauer, Marc Blau, Gene Carney, Sesar Carreno, Judy Cash, Timothy Gay, Shav Glick, Tracy Greer, Bob Hoie, Rick Huhn, Bill James, Brian Kamens, Mike Kopf, Bill Lamb, Len Levin, Jim McConnell, Ray Nemec, Rod Nelson, Rob Neyer, Mike Nola, Bill Nowlin, Gabriel Schechter, Ron Selter, Bob Timmermann, David Turk, Dr. Ben Wedro, Paul Wendt, and the staff at the public libraries in Los Angeles, San Bernardino, and San Diego, California; Tacoma, Washington; and the National Baseball Hall of Fame Library in Cooperstown, New York. 1 “The White Sox Lucky Man,” Chicago Tribune, July 15, 1919, 16. 2 Paul Green, “After the Scandal: The Later Lives of the Banished Sox,” Sports Collectors Digest, April 22, 1988, 198. 3 Information from United States Census via Ancestry.com and RootsWeb.com, accessed online January 24, 2007. Two of the nine McMullin children died in infancy. 4 Christopher Bell, Scapegoats: Baseballers Whose Careers Are Marked By One Fateful Play (Jefferson, North Carolina: McFarland & Co., 2002), 21; Los Angeles Times, December 28, 1930; March 25, 1936; May 5, 1940. 5 Jim McConnell, “Football Wasn’t Pasadena’s Only Game in Town,” Pasadena Star-News, March 25, 2002; Jay Berman, “A Streetcar Named Obscurity,” The National Pastime, Society for American Baseball Research, 2000, 58-60. 6 Los Angeles Examiner, September 26, 1910; The Sporting News, October 6, 1910, 8; “Fred McMullin.” SABR Minor Leagues Database, accessed online at Baseball-Reference.com. 7 “Northwestern League.” Spalding’s Official Base Ball Guide, 1915 (New York: A.G. Spalding & Bros.), 225, accessed online on July 16, 2008, at memory.loc.gov/ammem/spaldinghtml/spaldinghome.html. 8 Russ Dille, “When Giants Walked Seattle,” The Online Encyclopedia of Washington State History, accessed online July 15, 2008, at historylink.org/essays/output.cfm?file_id=7124. Curated by David S. Eskenazi. 9 Tacoma Daily News, March 23, 1914. 10 Tacoma Daily News, June 16, 1914. 11 Tacoma Daily News, July 24, 1914; Tacoma Daily News, July 25, 1914. 12 Tacoma Daily News, August 12, 1914; Tacoma Daily News, August 14, 1914. 13 Boston Globe, August 28, 1914; The Sporting News, August 27, 1914; The Sporting News, August 20, 1914. 14 Racine Journal-News, January 7, 1915; The Sporting News, September 10, 1914; The Sporting News, September 10, 1914. 15 William F. McNeil, The California Winter League: America’s First Integrated Professional Baseball League (Jefferson, North Carolina: McFarland & Co., 2002), 47-49. 16 Los Angeles Times, August 18, 1915. 17 Los Angeles Times, February 12, 1915. 18 Los Angeles Times, August 25, 1915. 19 Los Angeles Times, July 23, 1915; Los Angeles Examiner, August 4, 1915. 20 Marriage license for Fred McMullin and Delia Barnabe, Registration No. 19154000776, Orange County Clerk-Recorder’s Office, Santa Ana, California. 21 Washington Post, August 6, 1915; Los Angeles Examiner, August 17, 1915; Los Angeles Examiner, August 20, 1915; Los Angeles Examiner, August 21, 1915; The Sporting News, August 26, 1915; Reno Evening Gazette, September 8, 1915. 22 Los Angeles Times, August 27, 1915; Chicago Tribune, August 27, 1915; Chicago Tribune, January 27, 1939. 23 Los Angeles Times, October 15, 1915. 24 Chicago Tribune, April 28, 1916. 25 Chicago Tribune, June 3, 1916; Washington Post, June 4, 1916; Atlanta Constitution, June 18, 1916. 26 Los Angeles Times, November 6, 1916. 27 Los Angeles Times, January 25, 1917. 28 Ancestry.com, California Birth Index, 1905-1995; Chicago Tribune, February 28, 1917; Los Angeles Times, February 28, 1917. 29 Chicago Tribune, May 21, 1917; Chicago Tribune, May 29, 1917; Chicago Tribune, June 4, 1917. 30 Boston Globe, June 17, 1917; Chicago Tribune, June 17, 1917. 32 Chicago Tribune, June 19, 1917. 33 Chicago Tribune, August 1, 1917; Chicago Tribune, June 18, 1917; Richard Lindberg, Who’s On Third: The Chicago White Sox Story (South Bend, Indiana: Icarus Press, 1983), 39-40. 34 Chicago Tribune, June 18, 1917. 35 Chicago Tribune, September 19, 1917. 36 Sheboygan Press, August 20, 1917; Warren (Pennsylvania) Evening Times, October 2, 1917. 37 Chicago Tribune, October 14, 1917. 38 New York Times, October 17, 1917; Washington Post, October 16, 1917. 39 Chicago Tribune, October 18, 1917; “World Series Gate Receipts and Player Shares,” Baseball-Almanac.com; accessed online June 22, 2008, at baseball-almanac.com/ws/wsshares.shtml; Los Angeles city directories, 1918-42. 40 Washington Post, March 26, 1918; Chicago Tribune, March 28, 1918. 41 Chicago Tribune, April 26, 1916. 42 Chicago Tribune, June 25, 1918. 43 Chicago Tribune, August 2, 1918; Chicago Tribune, August 2, 1918; Washington Post, August 2, 1918. 44 Chicago Tribune, August 8, 1918, 14; Los Angeles Times, August 9, 1918. 45 Los Angeles Times, February 15, 1919; Chicago Tribune, February 19, 1919; Chicago Tribune, April 2, 1919. 46 The Sporting News, June 19, 1919. 47 The Sporting News, July 3, 1919. 48 Atlanta Constitution, August 31, 1919; Chicago Tribune, October 2, 1919. 49 Washington Post, September 25, 1919; Gene Carney, Burying the Black Sox: How Baseball’s Cover-Up of the 1919 World Series Fix Almost Succeeded (Washington, DC: Potomac Books, 2006), 168, 215-17. 51 Harold and Dorothy Seymour, Baseball: The Golden Age (New York: Oxford University Press, 1989). 52 Eliot Asinof, Eight Men Out (New York: Henry Holt and Co., 1963), 17. 54 Gene Carney, “New Light on an Old Scandal,” The Baseball Research Journal, Society for American Baseball Research, 2007, 74-81. Parts of Cicotte’s grand jury testimony from 1920 were read back to him when he was deposed four years later in Milwaukee. Happy Felsch, Swede Risberg, and Joe Jackson had each sued the White Sox for back pay due to them. Juries awarded them a pittance of what they seeked. 55 Asinof, Eight Men Out, 17, 91. “Black Sox Scandal (American League records),” National Baseball Hall of Fame Library archives via the SABR Baseball Research Center, San Diego Central Library. 56 For an overview of the White Sox' salaries in 1919, which weren't as low as commonly believed, see Bob Hoie, “1919 Baseball Salaries and the Mythically Underpaid Chicago White Sox,” Base Ball: A Journal of the Early Game, Spring 2012, McFarland & Co.
57 Carney, Burying the Black Sox, 44. 58 No players were punished by Commissioner Landis as a result of this “bribe,” which Swede Risberg and Chick Gandil brought to light in 1927. Landis called for hearings to discuss the matter at his Chicago office, but dismissed the accusations for lack of evidence. The only consequence of this series was that the practice of “rewarding” opposing players, which was common in those days, was formally banned. 59 Asinof, Eight Men Out, 14; Carney, Burying the Black Sox, 250; Martin Donell Kohout, Hal Chase: The Defiant Life and Turbulent Times of Baseball’s Biggest Crook (New York: McFarland and Co., 2001), 244-46. 60 Warren Brown, The Chicago White Sox (New York: G.P. Putnam’s Sons, 1952) 99. 61 Carney, Burying the Black Sox, 50, 55; Asinof, Eight Men Out, 131. 62 Chicago Tribune, September 24, 1920; Irving Stein, The Ginger Kid: The Buck Weaver Story (Dubuque, Iowa: Elysian Fields Press, 1992), 224; “Black Sox Scandal (American League records),” San Diego Central Library. 63 Los Angeles Times, October 14, 1919. 64 McNeil, The California Winter League, 63-65. 65 Carney, Burying the Black Sox, 15; Asinof, Eight Men Out, 141. 66 Chicago Tribune, September 24, 1920; Asinof, Eight Men Out, 145. Carney, Burying the Black Sox, 212. 67 Stein, The Ginger Kid, 216; Bill Veeck with Ed Linn, The Hustler’s Handbook (New York: G.P. Putnam’s Sons, 1965), 284; Pietrusza, Rothstein, 409; Chicago Tribune, May 10, 1920. 68 Stein, The Ginger Kid, 224. 69 Van Nuys News, November 25, 1920. 70 Chicago Tribune, September 26, 1920; New York Times, September 26, 1920; Boston Globe, September 27, 1920; Asinof, Eight Men Out, 167. 71 Boston Globe, September 29, 1920; Atlanta Constitution, October 30, 1920; Atlanta Constitution, November 6, 1920; Chicago Tribune, November 6, 1920; Carney, Burying the Black Sox, 215-17; Asinof, Eight Men Out, 138-42. 72 “Black Sox Scandal (American League records),” San Diego Central Library. 73 The Sporting News, January 20, 1921; Los Angeles Times, January 12, 1921; Los Angeles Times, January 13, 1921; The Sporting News, January 20, 1921, 8; The Sporting News, January 27, 1921; “Black Sox Scandal (American League records),” San Diego Central Library. 74 Los Angeles Times, May 9, 1921. 75 McMullin reportedly arrived in Chicago one day after the trial began. Because he was still under indictment, prosecutors could have chosen to bring a new trial against him even after his seven teammates were declared not guilty on August 2. But State’s Attorney Robert Crowe announced after the trial that “as far as I am concerned, the case is a closed book” and the charges were eventually dropped. See: Chicago Tribune, March 2, 1921; Fort Wayne News-Sentinel. August 3, 1921; Carney, Burying the Black Sox, 215-17; Kohout, Hal Chase, 246; “State Searching For Lost Papers,” Washington Post, August 4, 1921; Bill Lamb, Black Sox in the Courtroom: The Grand Jury, Criminal Trial, and Civil Litigation (Jefferson, North Carolina: McFarland & Co., 2013), 106-109. 76 Carney, Burying the Black Sox, 142-44, 147. 77 Green, “After the Scandal,” 197-98. 78 In order, those phrases were used in the following articles: Bob Considine, “On the Line,” Waterloo (Iowa) Sunday Courier, January 12, 1947; John Lardner, “Remember the Black Sox,” The Saturday Evening Post, April 30, 1938; “Concessions, Denials, Obscurity,” Sports Illustrated, September 17, 1956. 79 Los Angeles city directories, 1921-31; Los Angeles Times, February 5, 1931; California Voter Registrations, 1900-1968, accessed online at Ancestry.com, July 20, 2008. 80 Los Angeles Times, May 24, 1936; Los Angeles City Directory, 1938; Shav Glick, “He’s A Rose by Any Other Name,” Los Angeles Times, January 21, 2004; Shav Glick, email correspondence with author, July 14, 2005. 81 Los Angeles city directories, 1941-42; Los Angeles Times, April 1, 1949; Harry G. Hurley and Fred D. McMullin v. Roy W. Carter, et al, Case No. 597431, Los Angeles County Superior Court, filed March 27, 1952. 82 1940 US Census; Los Angeles Times, March 24, 1948. 83 Hurley v. Carter, 1952. 84 Hurley v. Carter, 1952; Los Angeles Times, May 20, 1952. 85 Los Angeles Mirror, November 21, 1952; Los Angeles Examiner, November 22, 1952; Los Angeles Times, November 22, 1952; Los Angeles Herald and Express, November 22, 1952; The Sporting News, December 3, 1952; “Certificate of Death: Fred D. McMullin.” Filed November 21, 1952. State of California, Department of Public Health, Reg. Dist. 1901, File No. 19321.